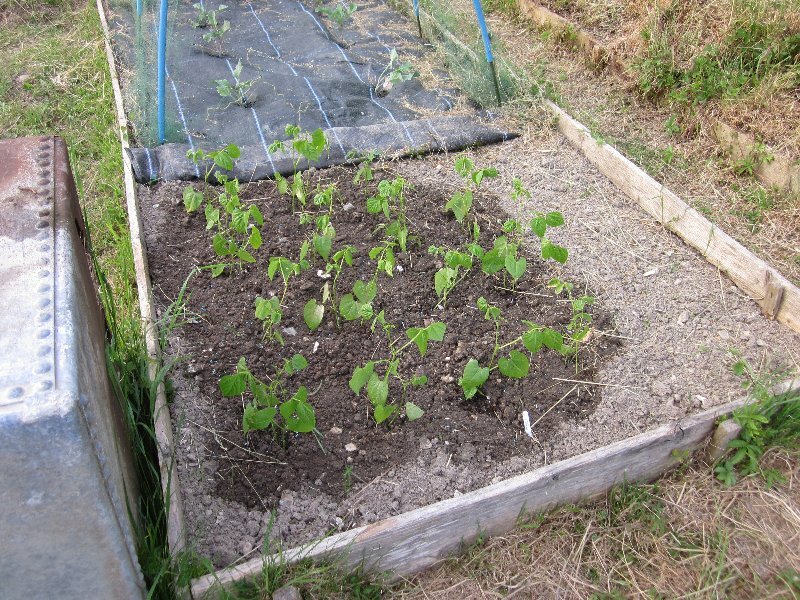 Late evening visit to plot, to plant the French bean seedlings before they actually flower. I sowed 30 of them (2 per pot) and have 29 seedlings, so not bad. 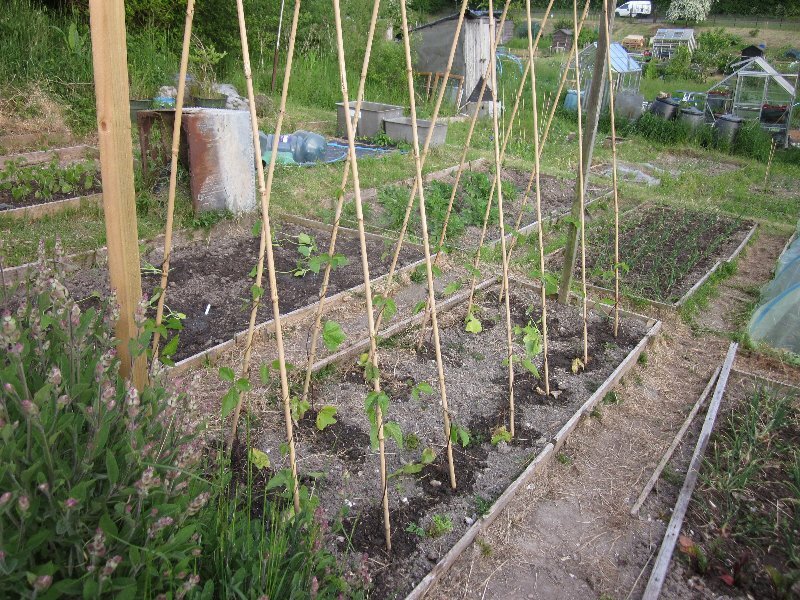 Rolled up the weed fabric by the PSB and pegged it down, then planted the beans. 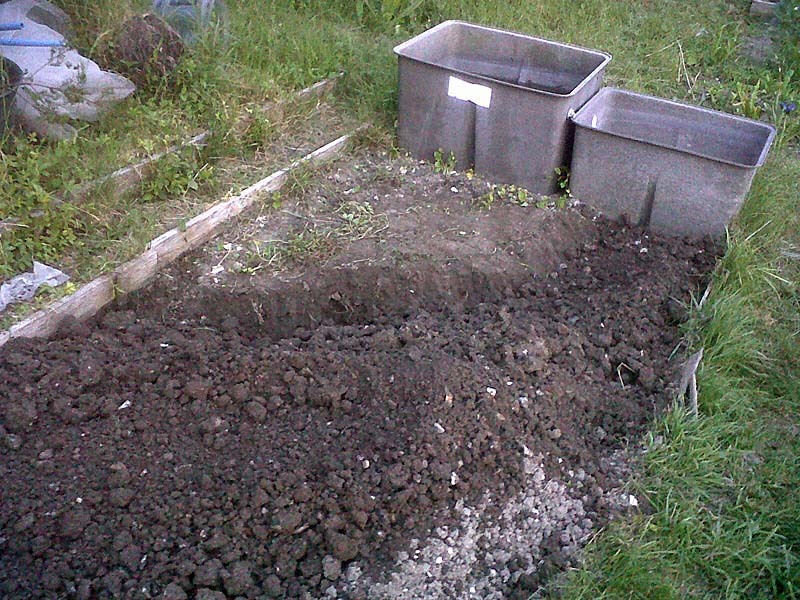 So nice to have decent soil at last – bet I won't say that when it comes to renovating the grassy beds! While I was removing the last couple of bits of bindweed from the uncovered bed, I got a visitor, who at one point pretty much landed on my foot in search of a grub! Wouldn't turn round for the photos though. Sowed a runner bean seed by each of the plants I put out last week, as insurance. The plants are clinging on (despite the rain we've had) and thankfully haven't all been got at by slugs. Dry days are forecast for the next week so that should help keep them going. 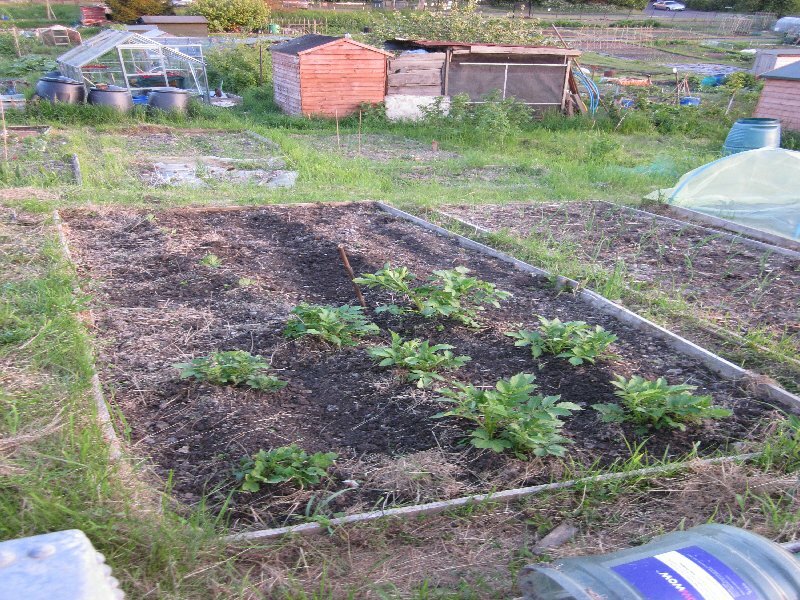 After that, went into weeding mode, having taken up the short Wolf handle and both swan and dutch hoe heads. 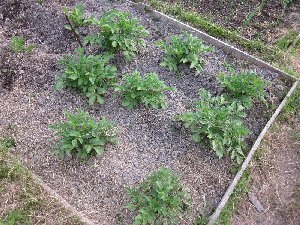 Earthed up the potatoes (last one finally up, after I think I accidentally hoed off the previous shoot!). Lot less weed now. Then hoed between the onions and the shallots. The latter have split in the last week – I may have (as usual) pathetic onions, but the shallots are going to be good. frosts are noticeably bigger than the others. 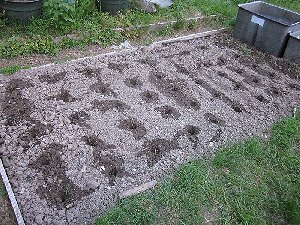 Finished off by hoeing the beetroot patch. There's still quite a gap between them and the sage, so have room for a courgette there. 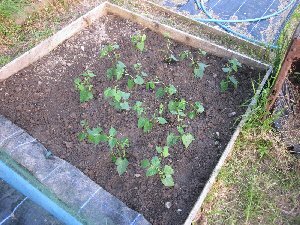 Was going to go up Sunday too, and remove whatever is bulging under the main courgette bed's cover, but an ill child took priority. 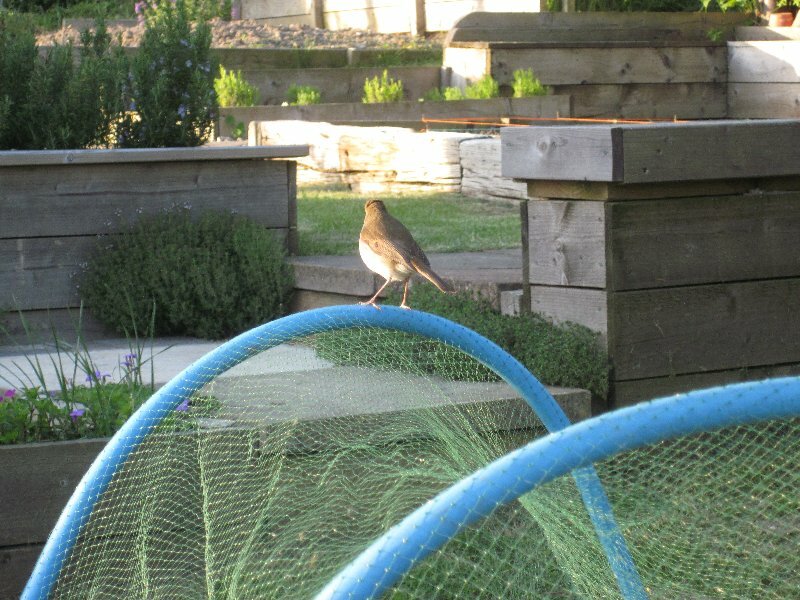 No hurry, have to finish hardening off the plants before I dare put them out. Next time: strimming again, possibly with help from the glyphosate spray if it's not windy. One pathway that I sprayed a week or two ago hasn't regrown, where others definitely have, so I must press on and get rid of the rest of the grass. Only then can I get on with replacing the edge boards. 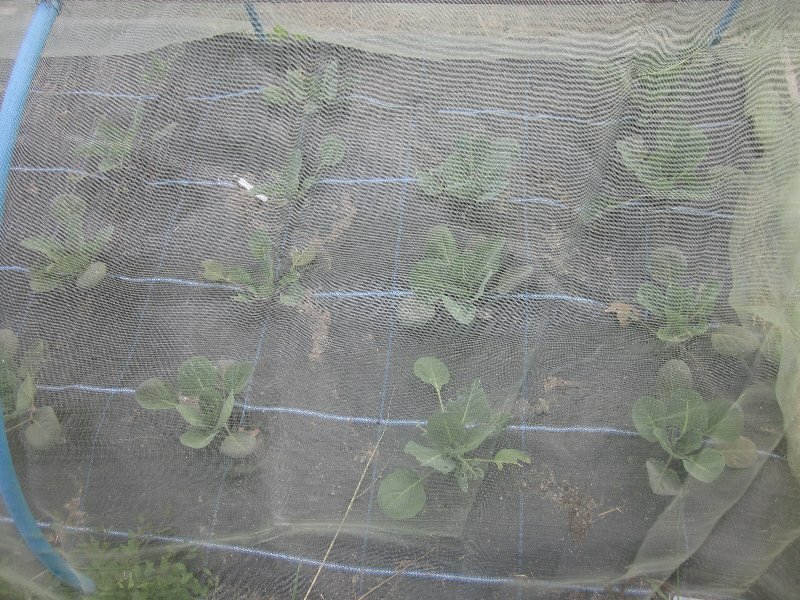 Also have to find some solution to the vanishing cabbages: I think the downside of the the weed cover fabric is that it allows slugs to live underneath. Either I have to take up the fabric that´s there or I have to eat my principles and slug bait. I picked six off the plants before I left (and put my foot on them). Still much too cold for June. I think the weather is more like April at the moment. 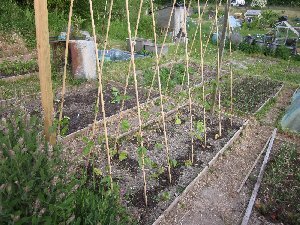 Still, at least it means I can put stuff out and not worry about it scorching (like the French beans in several previous years). Just hope we don’t set a new record for frost! Took up the cucurbits today, plus spare beetroot, red cabbage and PSB. Also took up a tub of slug bait. Hey ho. 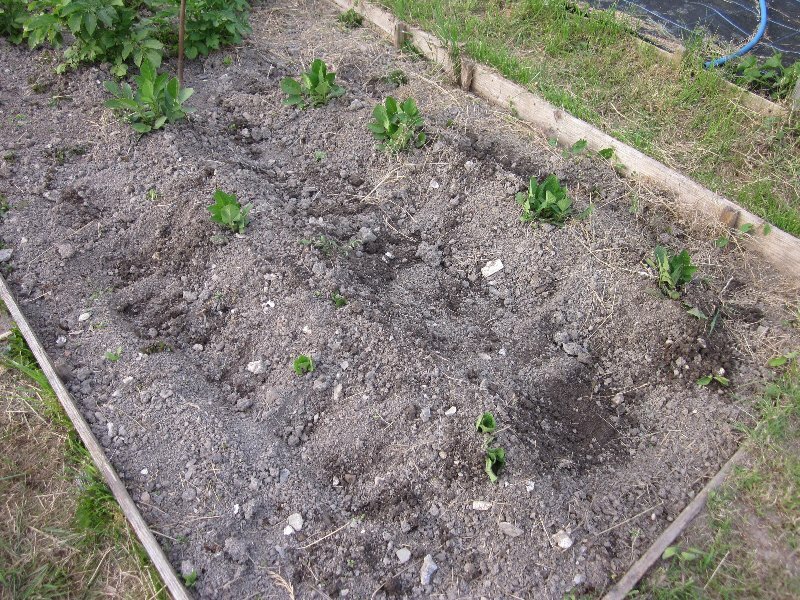 One PSB has been eaten down to one remaining leaf (no growing tip) and one minicole cabbage has vanished, but in general, nothing else has vanished this past week. Pulled back the courgette bed cover, rescued the pegs and packed it away. Bed looking very nice after last week’s efforts at weeding. 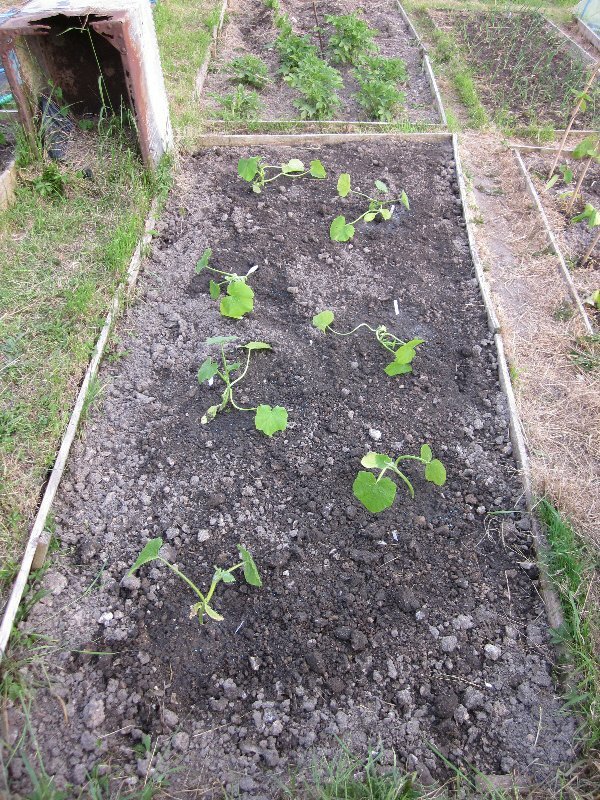 Planted four courgette Defender and two giant pumpkins. 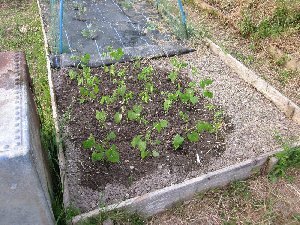 The other two pumpkins (from saved seed) are under the runner beans. Replaced PSB. Hoed everywhere, and watered. Rain due tomorrow, but at least this way everything gets a good soak. 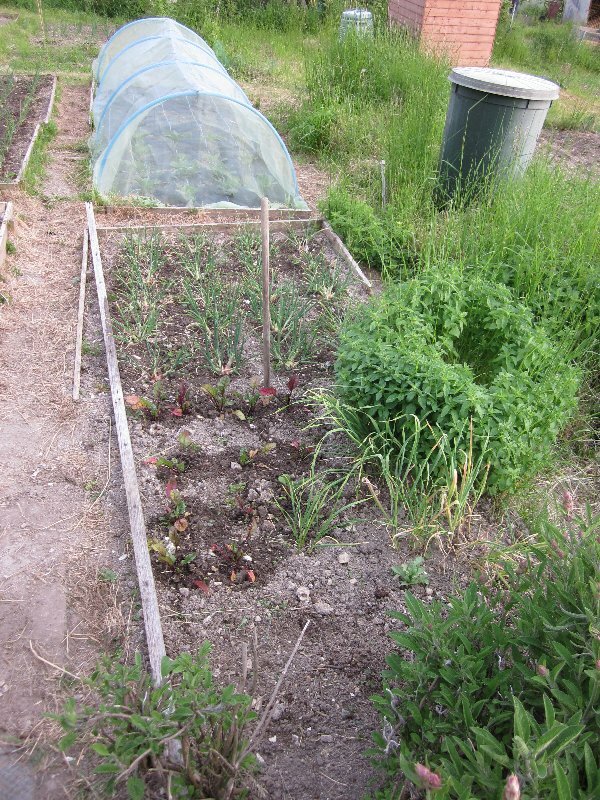 Courgettes and pumpkins Beans and pumpkins Beetroot, shallots and garlic Onions – looking much bigger! French beans, coming up to flowering. 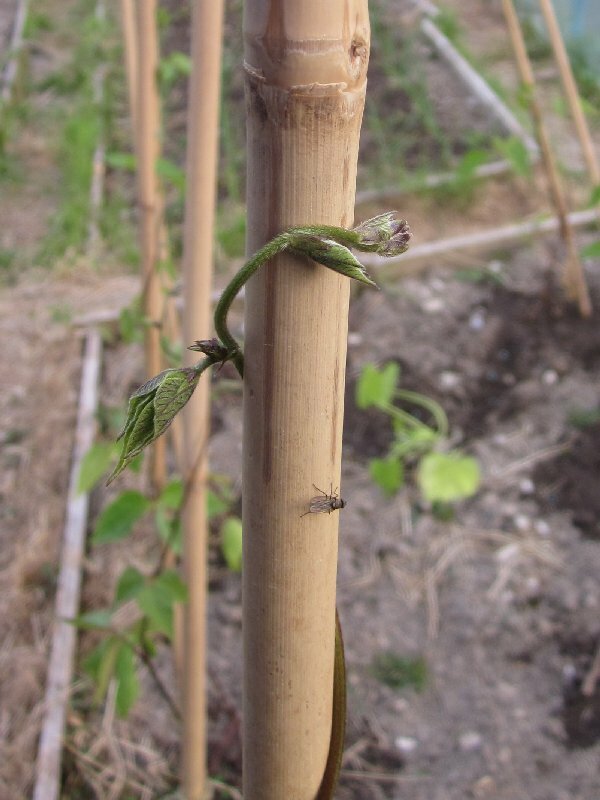 Runner bean tip. They are all happily twining now. I might actually have beans this year! It was supposed to be a nice easy trip up with the leeklets, a dibber (after unearthing it from the depths of the shed) and the hoe. Instead I spent over an hour trying to think up not-too-rude epithets for bindweed and couch bootlaces. I failed. 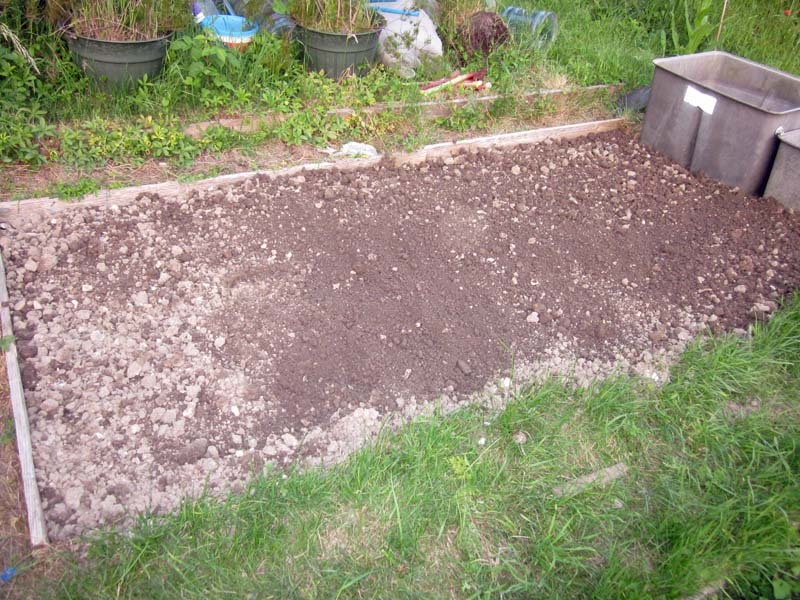 The whole blinking bed is riddled – and I thought it was dug over and cleared! ARGH! Towards the grass path edge it was solid, parallel couch bootlaces. Not good, especially when you only have a hand fork and only expected to have to weed out a few patches of bindweed. 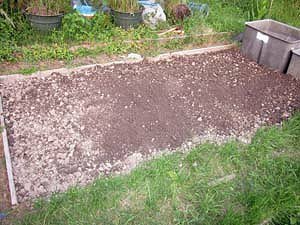 Spent about an hour and a half weeding, got about halfway and then it got dark and started to drizzle. Good job really. I was totally fed up. Here’s to next time, when I am taking up the big fork. After a week of muggy, damp weather, finally went up thinking that if I didn’t, I’d have no chance given the forecast (rain, thundery downpours). This time I did take the big fork, which was useful for the side of the bed where the couch was worst. Doing the rest was better with the small handfork though. An hour of toil under a lovely eve-of-solstice sky and warm temperatures wasn’t too bad, but I still failed miserably to finish the bed and the phonecam just about manages to show what is left. I should be grateful that the one really horrible bed is the one that I didn’t have to have finished a month ago. Everything else is growing well. The red cabbages are picking up – two of them are really quite large now. The minicoles are also doing extremely well. I think (hope!) they have now got past the point where the slugs can kill them. The final brassicas – the PSB – are really romping along now. 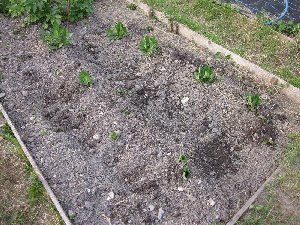 There are thousands of tiny weeds appearing in the courgette bed (I guess being uncovered has woken them up) so a good hoe is needed next time! And the runner beans – main ones, wow, and the secondary sowings have germinated by most of the poles and are at first leaf stage: hopefully they will do nicely. French are looking a bit odd: perhaps they need it hotter. 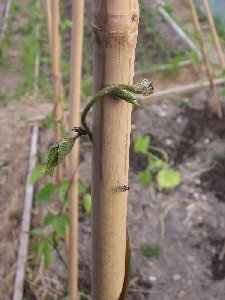 But there are buds visible. 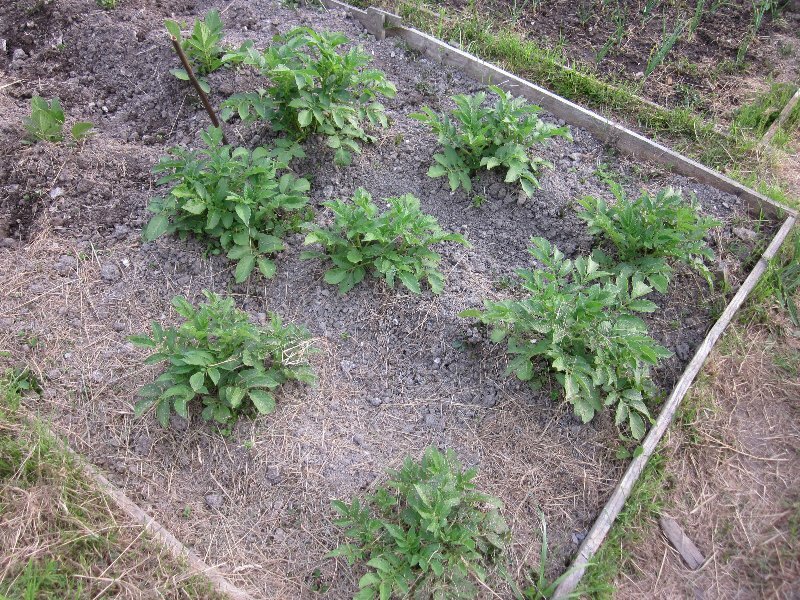 Potatoes are putting on a lot of growth. Onions are better than I’d expected though still not great compared to other people’s. But then that’s onions in my plot! Shallots doing great – already huge. So all told, pretty good. Next time: need to take up Wolf pole plus both hoes and the rake. 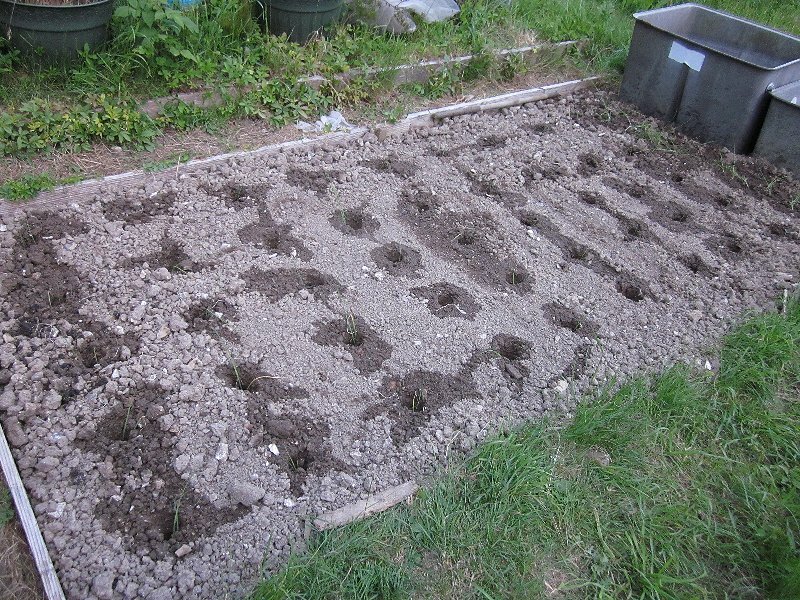 Then I might finally get the leeks in! The final corner, for next time! Sunset. 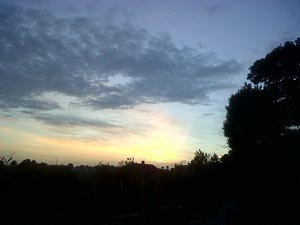 Bit of a sun pillar but phonecam not able to show it. Fine weather again., this time for a few days hopefully. Lots of weeds to hoe after the rain, not that we’ve had that much. Hoed just about everything. Watered just about everything. 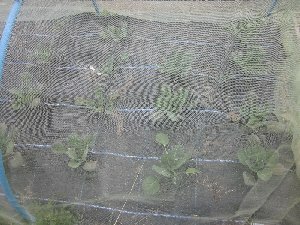 Said hello to Chris and traded some rhubarb (hers) for some gooseberries (mine) given hers have mysteriously collapsed. Some kind of gooseberry disease? We all hope not! Done. 45 Leeklets in, a large row of spares put in by the tanks and a handful donated to neighbours. Still have spare. But that’s it. Everything is planted. Went up with just a few tools, and after picking the vicious gooseberries over (ouch!) I sat down and spent an hour weeding. It’s been a long time since I did that, with most visits taken up with rather more pressing concerns like digging or planting. 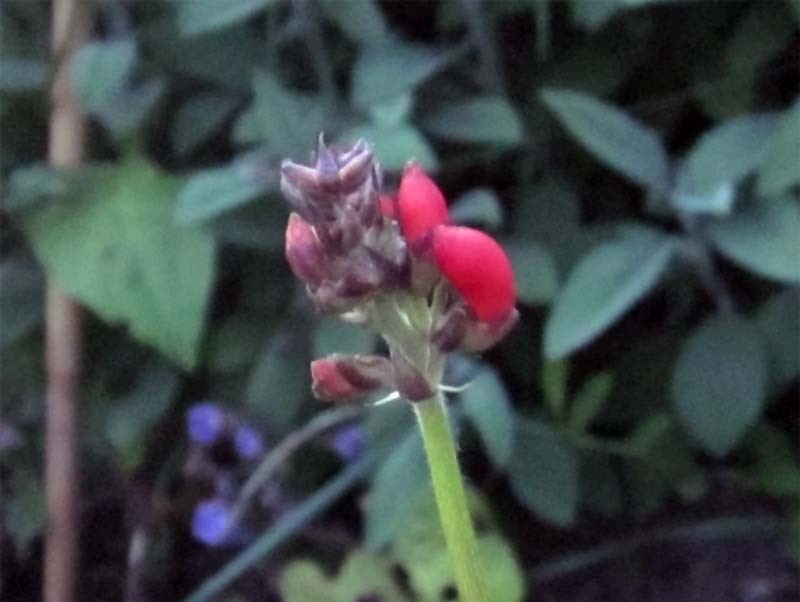 The French beans are now flowering (hooray) and they are weeded. 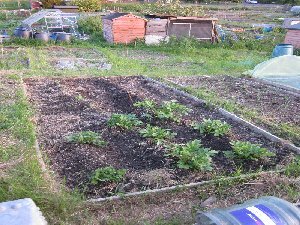 I’ve also done half of the PSB bed, which involved taking up the ground cover about 6” and reaching in to get the bindweed that is resurfacing. The problem there was doing the other side; a nest of red ants has taken up residence in the bed edge so no way was I about to sit down to weed that half! Moved on to the courgettes and found several of those are also trying to flower. Bit early? They are certainly a bit small. And then there was the shallots. 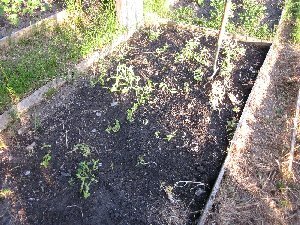 They seem to be mostly weed, so I spent most time doing that area. There are some tiddlers and some whoppers. Beetroot are getting bigger too. Runners are doing extremely well – some are nearly at the top of the canes. 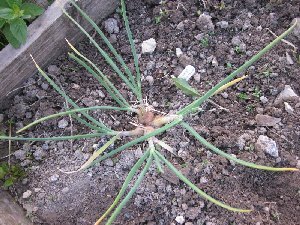 Managed to weed a few onions before I realised it was getting a bit dark, so watered everything and left. 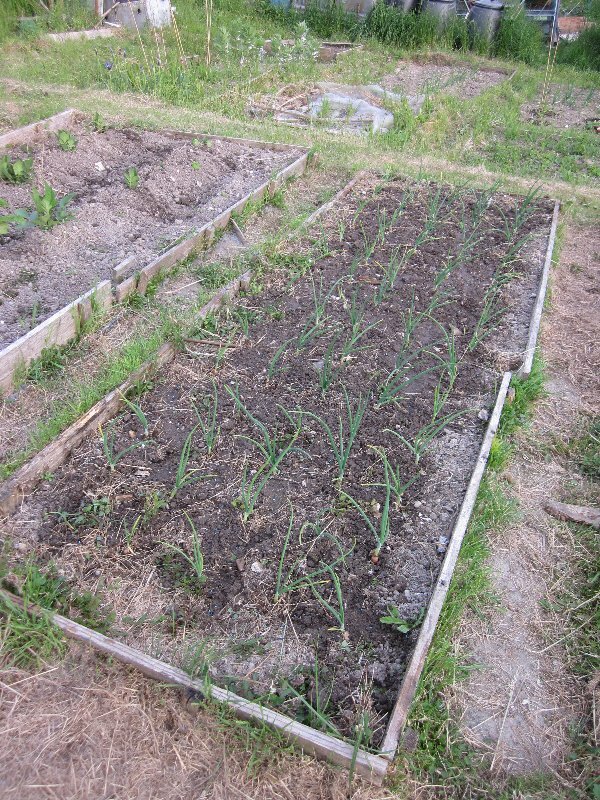 Next time I’ll weed the rest of the onions and the runners.